Women need comfort and style as well as performance when it comes to buying shoes for walking, running or daily for a daily workout routine. Brooks knows how to cater to the needs of the user and provide comfort along with style in a durable form. 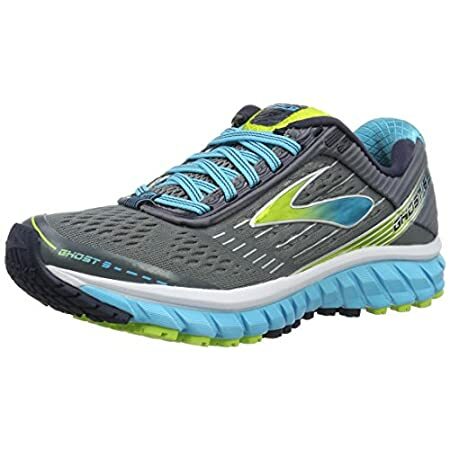 This Brooks women's ghost 9 is definitely an upgraded version after the massive popularity of Ghost 7 and 8. But it is far better and is with improved features women need. The basic materials that have been used in the making of this shoe include mesh fabric, synthetic overlay, rubber, foam and other fabric lining making the interior more comfortable as compared to other shoes like these. All the materials used in the shoe are of higher quality and assure long-lasting performance by giving a durable structure. The shoe top has been made with the high quality, flexible and breathable mesh fabric that assure the shoe fits snug on the foot and keep the airflow to the inside for cooler inner side to avoid sweating and squishy feeling inside the shoe. The synthetic overlays offer better fit and shape as well as increased the durability and look of the shoe as well. In addition to that, the lace-up style makes it easier to wear and allow the better fit to avoid twisting in the shoe. Definitely, when you need to look for a running shoe or a walking shoe, the tongue area, as well as the collar, should have enough padding to provide comfort and support for a better walk and to keep the ankle and foot muscles stress-free for a fatigue-free walk. The cushioning in these areas also keep the foot in place. For keeping the comfort level up to the desired mark, the shoe comes with a soft and comfortable inner lining made of high-quality fabric. In addition to that, the insole is made up of a soft foam that is also removable so that you may insert or adjust according to your needs. The BIOMoGo DNA make sure to offer perfect cushioning in the shoe that is gender friendly and allows better foot adjustment and comfort for the user. The cushioning allows support as well as sufficient push and energy for keeping the walk easier and make sure the fatigue factor is lowered to the minimum. The breathability and comfort level is complimented with the use of mesh fabric on the top and stretchy upper that allow easier fit and enough air flow to the inside of the shoe for keeping the foot cool and free from excessive sweat. With the help of the specialized crash pad construction that is segmented and well-designed to offer easier gait-cycle, the pressure on the foot muscles is released and the sole offers the foot an increased energy to walk briskly without feeling pressure or weight. With these features, the shoe offers a lighter and faster walk without feeling burden on your muscles. The shoe is lightweight and makes use of the lightweight overlays and foam to keep the shoe comfortable, good looking and well-fitted to the foot for a better walking experience on the ground. Due to the lightweight construction, the user feels easier to walk and run for hours without building up pressure on the foot and calf muscles. The outer sole of the shoe consists of Omega Flex grooves for better grip and fluid movement without creating pressure on the forefoot area. In addition to that, the blown rubber material on the forefoot keeps its grip on the ground and provide cushioning as well. It is durable and makes sure to support the shoe for several miles without getting ripped off. The grip and tracking are perfect on the ground. The grooves on the outer rubber sole make sure they keep the foot stable on any surface and keep the hazards away with an anti-slip action and closer grip on the ground surface. That is why it tracks well and make sure you wear and use the shoe without any worries. The shoe supports Supination or it is perfect for the neutral or underpronation walk styles. The shoe fits the true size of the user though it is always better to look for the right size and width before getting one. The shoe is no doubt one of the best among the walking shoes and running shoe. As per the customer experience, the shoe has won over 1000s of customer reviews online and around 75 percent of them rate the shoe as a five-star shoe. Such a user experience reflects high-quality performance and long-lasting support for the regular users. Though there are many personal factors that may affect the performance and the output of the shoe as well.